Have you been to Michael's lately......yikes. I can't believe what they can charge for a styrofoam form. The rebel in me decided that free cardboard was a way I could still keep my shirt while crafting! I started to cover the largest form with dried oranges. I kept going until it was almost covered. I added a few Christmas sprigs of red and green and that was tree number one. I built my own star jig. I cut out a star with cardboard and nailed ten finishing nails into a 2x6 at each point and corner. I used finishing nails so that the wire would slide off easily. Copper wire was wrapped around the nails alternating as I went. I made two more so I had three in total. I pushed the wire through the top hole and filled in the top of the tree with glue and pine cones and embellishments. This acts as a way to transport the tree too. My next tree was covered completely with dried oranges. I stuck in the star and put a few pieces of orange and Christmas sprigs around it with glue to anchor the star. For tree number three, I got some jute and started wrapping. I loved it, just plain with the star, but when I put it up to the other two I felt it was naked. I grabbed some raffia and wrapped it around the tree like a garland. I took some Christmas sprigs and pine cones and glued them on around the raffia. I took these trees one step further. Check out what I did HERE! I hope this inspires someone the way that I get inspired from all of you! I Only Party With The Best! wow karen this is soo beautiful! I love all of them esp the tree with dried oranges. great job! Thank you! I had fun making them too! They are beautiful, I LOVE the twine version. I've been trying to come up with a cheap base for some "trees" like this for years. OK, I haven't been trying very hard but this is perfect. So glad I can stop racking my brain. I even have a big roll of that paper! Love your trees, and thanks for the tip on adding the orange oil, great idea! Those are awesome! I have to make those for next Christmas. Thanks for sharing!!! 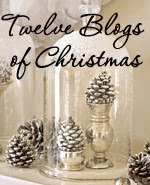 Thanks for linking to the Simply Christmas inspiration Party at Shabby Art Boutique.